CORRECTION: This article originally stated that the author of the critical Sporting News quote was Chris Mottram. Instead Mottram was merely posting a piece by blogger Vince Grzegorek. All Brandon Marshall wanted was the opportunity to be part of the moment. The Denver Broncos wide receiver wanted to feel connected to the thousands who have flooded into the streets and the millions in a state of shock and awe around the world, celebrating the election of Barack Obama. Unfortunately, we will never know what would have happened, or how the crowd would have reacted. We will never have that image of a football player bringing politics to the field. Marshall did score a touchdown, but as he removed the glove from his pocket, his teammates stopped him. One can be charitable toward Stokley and Sheffler, given the moment in the game–although the image of two white players surrounding a black player to block his political statement is the antithesis of the very ideas Marshall was attempting to communicate. There is no question that Marshall was taking a risk. There’s no question he could have cost his team the game. 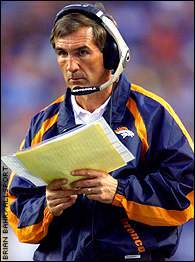 His coach, the stone-faced Mike Shanahan, has a written rule about not bringing politics into his all-business locker room. Marshall could have risked the ire of the NFL, known as the No Fun League for cracking down on any hint, any whiff, of individuality on the part of players. But maybe Marshall thought that the moment was more important than the game. Maybe he looked at basketball players like Kevin Garnett, who had the slogan “Embrace Change Vote ’08” written on his sneakers, or Carmelo Anthony, who said that he would score forty-four points Wednesday in honor of the forty-fourth president. Marshall wanted to be part of the energy that has inspired more pro athletes to take part in this election cycle than ever before. Instead of derision, Marshall merited our respect–sports fan or not– which should actually be exponentially higher since he was willing to take this risk when the game was on the line. The image of a pro football player raising a black-and-white hand to the skies forty years after Smith and Carlos and two days after the election of a black president in a country built on slavery could have echoed through the ages. Someone should tell the suits and ESPN: some things are actually more important than sports.